Re-invent Friday night family dinner with Deep Dish Veggie Pizza! 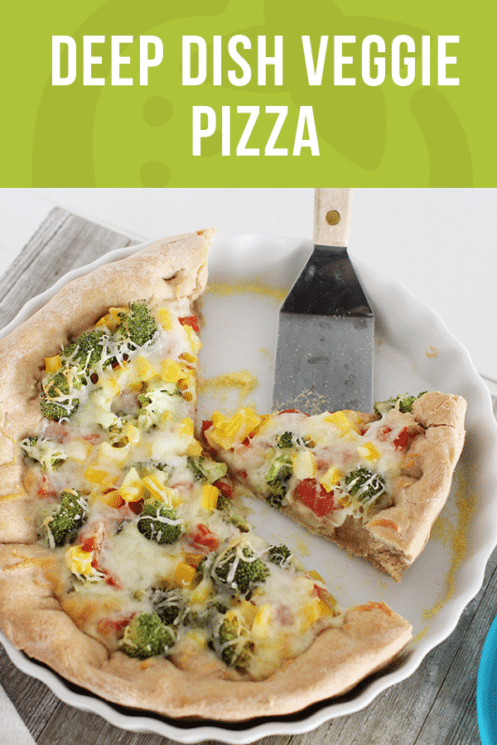 This pizza is made with homemade, whole wheat dough and topped with fresh veggies for great taste, texture, and nutrition. What’s cute, short, and loves to eat pizza? Yes, the answer is kids. Your kids, my kids, basically everybody’s kids love pizza. So let’s run with this. You probably think pizza falls in the “junk food” category. But look a little closer, and you’ll see the building blocks of a balanced meal. 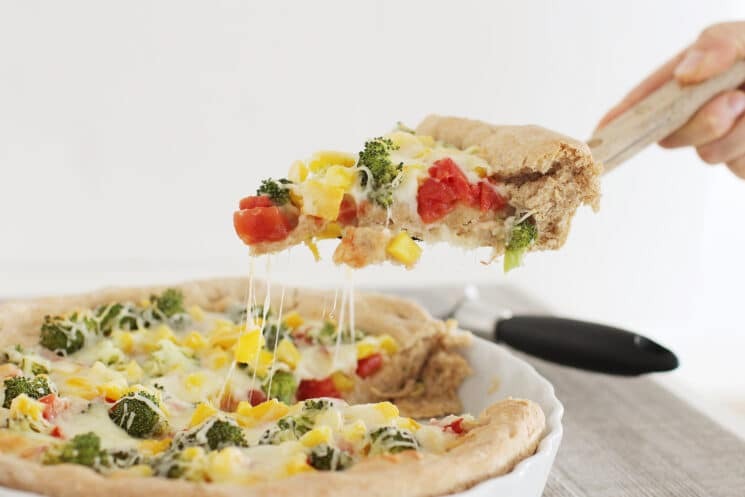 The crust is a grain (it can be a whole grain,) the cheese provides protein and fat, and the toppings are more often than not fresh vegetables. 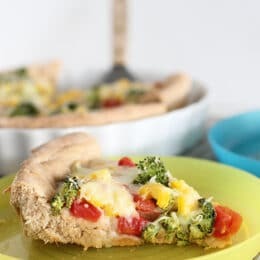 In this Deep Dish Veggie Pizza, we’ve loaded in the veggies and whole grains to maximize the nutrition without sacrificing the gooey, doughy appeal of the pizza kids love to eat. Try it for a healthy twist on delivery this Friday night. When you’re making deep dish pizza, a good crust matters. We use our own Best Homemade Pizza Dough in this recipe because it’s easy to make, rich in whole grains, and has a fresh, yeasty taste. Prep your veggies while the dough rises. 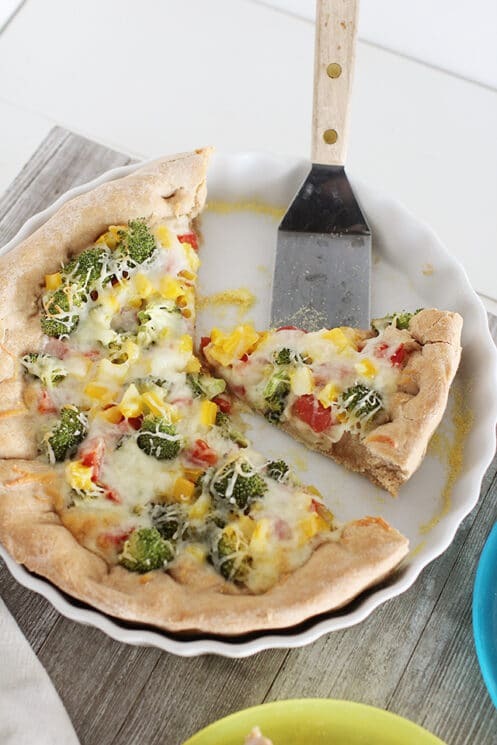 Broccoli, peppers, and tomatoes work perfectly. But just about any veggies are fair game to throw on top of this pizza. The heavy-duty crust can support a lot of add-ons, so go wild: mushrooms, onions, asparagus, or even broccoli raab would all be delicious. If you’re not sure your kids will like all the red and green stuff, let them help pick and sprinkle on the toppings. The more they get involved, the better chance they’ll eat. Here’s one thing you should know about making deep dish pizza. You want that pillowy-soft, doughy bottom, right? But you don’t want a wall of bread in place of a crust. Remember that your dough is going to expand in the oven, and make it just a tad thinner than you think it ought to be. One more tip: if you’re using a cast iron skillet to bake this pizza, let the skillet preheat in your hot oven. This will help crisp up the bottom of the crust. Just be careful to avoid burns when you’re laying the dough in a hot skillet! Add yeast, sugar and water to a large mixing bowl. Let sit for 10 minutes. Stir in salt, oil and flour. Knead dough in mixer or on a floured surface just until no longer sticky. Put in a greased bowl and let rise for 25-30 minutes. Grease pie dish or casserole dish and sprinkle with corn meal; cast iron skillet will offer best results. Set aside. Preheat oven to 475 degrees F. Punch dough down and spread into prepared dish. Dice pepper, dice broccoli and drain tomatoes. 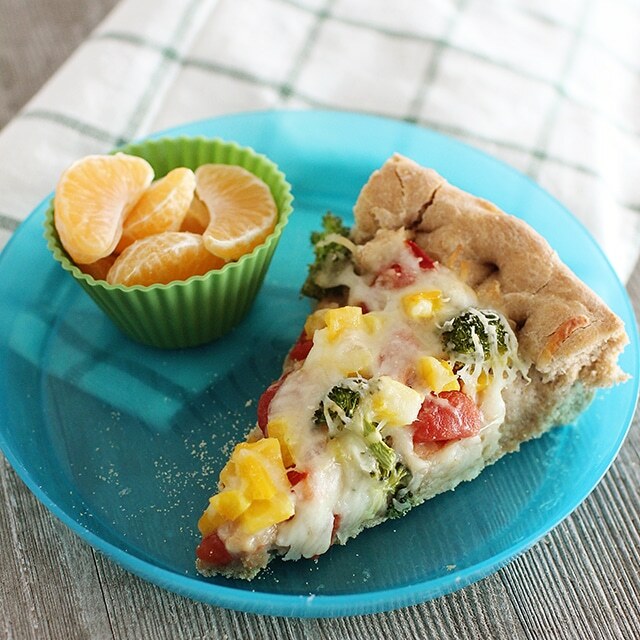 Layer the drained tomatoes and veggies onto dough. Shred mozzarella onto top of pizza. Oh my! That looks so yummy! 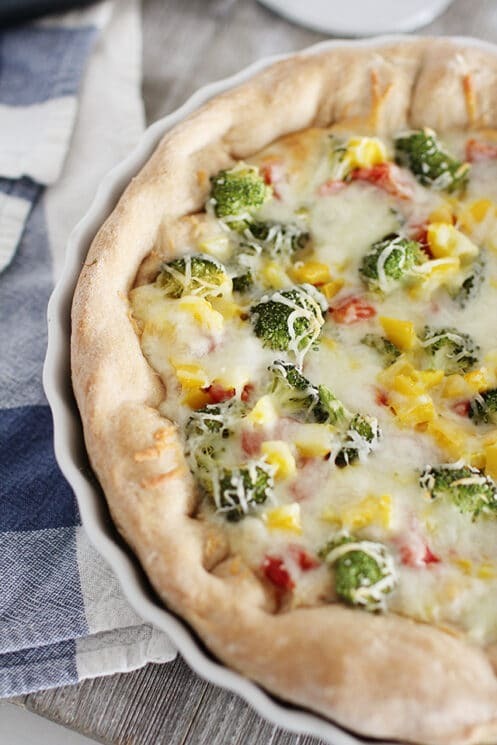 We’ll definitely be trying this one on our Friday night pizza night! We LOVE pizza in the cast iron skillet! I had to buy another (larger) skillet because it is so popular. I never thought of using a cast iron skillet for deep dish pizza! I am going to have to try that soon! Looks great. I copied the recipes, complete with pictures. Thanks! What would you suggest to bake it in if you don’t have a cast iron pan? You can do the same thing in a regular pizza pan, or cookie sheet. But you really should look into a cast iron pan. Mine was $20 at IFA.